← Himalaya Herbals Purifying Neem Face Wash! Grab your FREE 2 Travel Size today! 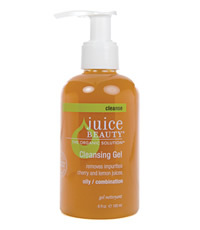 Juice Beauty has the Highest Organic Content in Skincare. Juice Beauty is free from Pesticides, Petroleum or Petroleum deriatives, harsh Preservative such as Paraben or Sulfates, Artificial Colors Dye, Synthetic Fragrances, Phthlataes or Toluene, which may irritate or harm skin. Unlike other skincare products, Juice Beauty does not use water(aqua) as a base but a 100% organic juice base. Juice Beauty’s certified organic ingredients are packed with age-defying potency… Powerful antioxidants and polyphenols, essential vitamins, vital phytonutrients and age-defying hydroxy acids. All organic ingredients have met the strict USDA organic guidelines. Prone to blemishes and red bumps? Practice these simple steps to help clear your skin. With organic fruit juices, supply your face with a boost of vitamins, antioxidants and polyphenols. Step 1. Cleanse with Cleansing Gel. Step 2. Spot treat twice daily on blemishes with Blemish Clearing Serum. Or warm 4-6 drops in palms and apply an even layer to face and neck. Use under a moisturizer or alone. If excessive dryness occurs, reduce application to every other day. This entry was posted in 1 and tagged Fr3b, Fr3b Singapore’s 1st Sampling Concept Store, Fr3b.com, free beauty samples, Free giveaways, free samples, freebies, JUICE BEAUTY ORGANIC SKINCARE, S’pores 1st Sampling Concept Store, singapore free beauty samples, singapore’s 1st online sampling platform. Bookmark the permalink. So many people consider him one of the best natural products for skin care for aging skin. It’s like another home to make products which are not scientifically tested, or the process or rules. We must also take care of certain substances such as alcohol, mineral oil and parabens in products for skin care are made in the United States who were suspected of being toxic, allergic neurotoxins and carcinogens. So maybe the soap so sure! Hey Fonda, you can sign up for a free account at thesamplestore.sg, then you can checkout the samples that you are interested in.